Dracula has been resurrected again. You as Nathan Graves must travel through the Castle Dracula to find and stop his reign of evil. 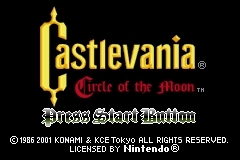 This entry in the series is in the vein of Symphony of the Night. 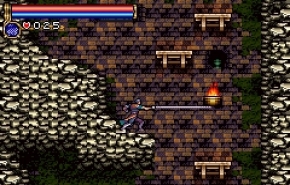 Similar to Metroid, you can roam the castle freely. Powering up your character is accomplished by by finding new items. Similar to an RPG, you earn experience and level up throughout the game. There is a spell system using cards. There are two kinds of card deck. When you combine a card from one deck to the other, you cast a spell. Some spells are offensive, while others are defensive. You figure out the combinations via trial and error. This system works well for me. I really enjoy the amount of variety allowed here. This is one of the better orignal GBA games.